Rob Cesternino and Akiva Wienerkur continue their journey to watch every Seinfeld episode as they discuss Season 4, Episode 1, “The Trip”. Rob Cesternino’s trip to New York is over, but he and Akiva Wienerkur are buckled in and ready for their trip through Seinfeld’s season four. 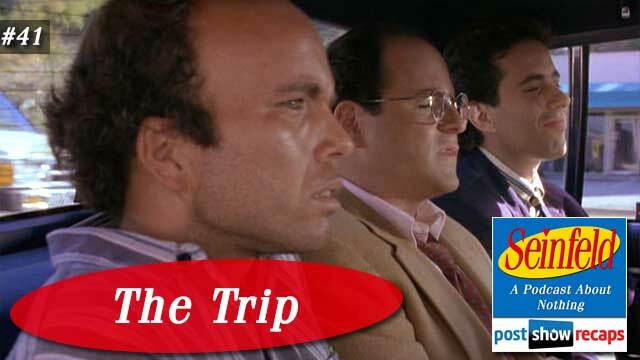 This week, they’ll talk about the two part season premiere, “The Trip”, which first aired August 12 and 19, 1992, and was written by Larry Charles. Akiva shared that the early start to the seasonwas due to NBC running the summer Olympics in Barcelona, and needed to have some big premieres directly after it to capitalize on advertising. There were two bits of current news in the Seinfeld universe. First, Roger McDowell, the alleged second spitter in “The Boyfriend”, recently told a reporter he still gets a check for $13.52 every time the episode airs. Also, the rights to Seinfeld are being shopped to Yahoo, Amazon and Hulu, and the bidding is rumored to be north of 90 million dollars. Jerry’s opening standup is a bit about people moving across the country. The episode opens with Jerry and George at the coffee shop where George reveals that he knew Kramer was going to Los Angeles, but actually kept it a secret. Jerry invites George to LA with him when he goes for his The Tonight Show appearance, thinking they can track down Kramer while there. Rob noted that George’s complicated preparation process for the trip was a bit broad and unlike George. Kramer is in LA, and we see him mentoring a group of young actors when a security guard promptly throws him off the set for loitering. He heads back to his rundown apartment and has a conversation with his washed up actress neighbor, who wants to go have frozen yogurt with him sometime. In the next scene, some LA police officers are investigating a murder scene. Akiva pointed out that one of the cops would later go on to play Jake Jarmel in “The Opposite”. At the airport, Jerry and George have trouble getting through the security line, with Jerry repeatedly setting off the metal detectors and George carrying a big bottle of moisturizer. There is another Jerry standup, this time a bit about how the people riding in the carts at the airport are the closest thing this country has to royalty. In the next scene, Kramer is at an audition, where they are casting for four different jobs, a horror movie, an infomercial, a rock video and an exercise tape. Kramer meets a woman named Chelsea at this audition and they go out to coffee, where he shows her the treatment he wrote called “The Keys”, hoping she can pass it along to her manager. While at the coffee shop he notices Fred Savage, and has an awkward interaction that prompts Fred to run out of the place to avoid further conversation. Akiva shared a fun fact that the woman playing Chelsea now runs a celebrity Pilates class. Jerry and George are in their hotel room in LA, with Jerry on the phone trying to track down Kramer. Rob wondered who Jerry was talking to, whether it was the Murphy Brown production staff or the police. Meanwhile, George is having a long conversation with Lupe the chambermaid about making sure the bed sheets are not tucked. Jerry asks her if she noticed a crumpled piece of paper on the night stand, since he crafted one of his jokes for The Tonight Show on it, but she had thrown it away. After she leaves, George defends Lupe when Jerry gets upset about her throwing the paper away. Akiva felt Lupe couldn’t possibly know to keep a crumpled up piece of paper when her job is to clean the room. In the next scene, the cops are investigating another murder, and we see that it’s Kramer’s new friend Chelsea. While searching the scene, one of the officers finds Kramer’s “The Keys” treatment “on her person”. At The Tonight Show, George has conversations with Corbin Bernsen and George Wendt about some ideas he has for their respective shows. When they have their interviews, they both comment how there are always “whack jobs” coming to them with dumb ideas for the show. The scene cuts back and forth from the TV interviews to the police interviewing Kramer’s neighbor and the burnout who he hitched a ride from in the last episode. Rob and Akiva both enjoyed the callback of this character from last season’s finale. Jerry performs his act on the show, and struggles mightily with the wording of his bit because Lupe threw out his paper he used to craft it. As they are leaving the set, they see a news report citing Kramer as the prime suspect for the recent murder spree. There is a Jerry standup bit where he talks about the chalk outline drawer on the police force. Back to the episode, Jerry and George decide to call the police to profess his innocence. Rob noted that the mundane conversation they have about bad breath and spare change are always his favorite parts of the show. The detectives send a car to pick them up, and on their way back to the precinct, the cops arrest a man, played by Clint Howard, and throw him in the back with Jerry and George. The arrested man carries on some conversation with them, offering them insight on what to tip a chambermaid. They talk to Kramer when they get to the station, and he’s not aware of the seriousness of the situation. After a short time, the police let Kramer go since someone else was murdered while he was in custody. The three are all talking outside after being released, trying to convince Kramer to come back to New York, though he still has “the bug” and wants to stay. Back at the hotel, we see George struggling to get the sheets free as Lupe had forgotten to leave them untucked. The final scene is George and Jerry back in New York, and Kramer inexplicably walks in like nothing has changed. Jerry and Kramer toss each other their spare keys, with everything essentially back to normal. The episode ends with a news clip showing that the serial killer turned out to be the man that George and Jerry rode in the cop car with. Akiva ranked this two part episode as one, and though he did like it, he thought it lacked a ton of laughs, so he ultimately put it at 110. When discussing what about this episode would be different in 2015, they concurred that a cell phone would make this whole premise unnecessary, and the TSA would have never allowed Jerry and George on the plane. There were a few emails for this episode. Amir commented how excited he was for the great season four to start. He also pointed out how glib they all were about such dark things like murder. Next, Johnny De Silveira wondered if Akiva has ever lived outside of New York, but Akiva wasn’t giving up that info. Chester asked what they prefer in a hotel bed, tucked or untucked. He also wondered why the LAPD would bring the aging actress and burnout in for questioning and not just apprehend Kramer first. Rob and Akiva furthered that thought by adding why they wouldn’t just ask his neighbor where Kramer lives. Lastly Chester questioned the timeline of all the events that happened in the episode, and how it was to all happen in just one day. Tune in next week as the guys will recap “The Pitch”. Since “The Pitch” is a two part episode along with “The Ticket” that follows, Rob asked the listeners if they’d prefer to cover both in one podcast, or split them up. Email your suggestions on this and of course send in your questions by emailing [email protected] . Don’t forget to subscribe to the podcast by going to postshowrecaps.com/seinfeldITunes where you can rate and review the podcast. Follow them on twitter @robcesternino and @keev26.